The unity3d platform is about to realize about 900% or 9x more possible market for selling their wares and I believe will blow up with unity 2.5. Unity3d 2.5 will bring a windows IDE and development environment to unity3d developers. Many game companies are heavily invested in Windows and having this option is breaking down a huge wall to get this development platform and engine into many new hands and companies. The best part about unity 3d development is the hardware acceleration, the fantastic pipeline, the ability to publish desktop, web, mobile (iphone) and console (wii) is pretty amazing. All using the powerful mono open source .net framework as a base. Unity 2.5 adds full support for Windows Vista and XP, with 100% feature parity and interoperability with Mac OS X. The Unity Editor has been rebuilt to look, feel, and function identically on both operating systems, each running the same underlying engine. The best part? Unity on either platform can build games for either platform — cross-platform in the truest sense. Find the tools you need quickly and easily. The Play buttons are front and center, clearly visible and inviting you to play, test, and improve your work. And when you do, they light up, dimming the rest of the application, drawing your attention to the most important things in the play experience you’re creating. Snap any object to customizable increments of position, scale, and rotation values. Drag objects around, clamped to any surface collision. Manipulate objects in local or world space. Use the new flythrough controls to get around easily. And did we mention the completely redesigned rotation tool? Drag and drop your .max files right into the Editor, including support for all skeletal based animation, multiple UVs, and vertex colors. Autodesk 3ds Max now joins the existing support for Maya, Blender, and all other 3D applications that integrate with the latest FBX plugin on the Windows platform. UnityGUI, Unity’s own GUI creation system, now powers the entire Editor and allows you to integrate your own unique level design tools, AI control tools, debugging tools, difficulty tuning tools, or anything else you need. Over 130 new API entry points enable you to create specialized, customized editor tools and build them into the existing Editor interface. We took cues from the best designed applications, and the rewritten editor has received dozens of improvements. The most visible change is the tabbed interface, where every part of the interface can be moved, undocked to a secondary monitor, and even stacked to achieve logical grouping. We’ve gone to great lengths to make sure that you always have the info you need, when you need it. Model files have previews right inside the inspector. Audio Clips show their waveform with click-to-play behaviour. Meshes show the detailed rendering stats – and that’s just scratching the surface. Adobe will essentially open up the RTMP protocol officially. RTMP has been used in other tools such as Red5 and haXe video for some time now. But officially having it open will make it possible for more products built on it. I am sure that most of this is to combat silverlight and to gain more video users that can play flash formats. RTMP spec will be posted here when ready. RTMP provides an enhanced and efficient way to deliver rich content. Developers and companies will have free and open access to the documented RTMP specification to help enable unparalleled delivery of video, audio and data in the open AMF, SWF, FLV and F4V formats compatible with Adobe Flash Player. Adobe has also been working on more real-time protocol tools based on UDP instead of TCP (which RTMP is based) that fall under RTMFP using ordered UDP that will be interesting to watch evolve. Stratus is so far a sample of what is to come there.The UDP based real-time tools will be able to beat the capabilities of TCP based real-time tools when using authoritative servers. But with the RTMP announcement, multiuser and video applications should thrive even more with an open RTMP spec. I use a SoundManager class for games and interactives that require it which I picked up at evolve by Matt Przybylski. But I sometimes need to use Tweener rather than TweenLite depending on what the project uses already. So here is the class updated with Tweener. Just grab the latest Tweener to work with this. Sound is one of those things like tweening, it is easier to reuse code if everyone uses common libraries. * The SoundManager is a singleton that allows you to have various ways to control sounds in your project. * fade sounds up or down, and allows additional control to sounds not readily available through the default classes. * This class is dependent on TweenLite (http://www.tweenlite.com) to aid in easily fading the volume of the sound. * Adds a sound from the library to the sounds dictionary for playing in the future. * Adds an external sound to the sounds dictionary for playing in the future. * Removes a sound from the sound dictionary. After calling this, the sound will not be available until it is re-added. * Removes all sounds from the sound dictionary. * Plays or resumes a sound from the sound dictionary with the specified name. * Stops the specified sound. * Pauses the specified sound. * Plays all the sounds that are in the sound dictionary. * Stops all the sounds that are in the sound dictionary. * Pauses all the sounds that are in the sound dictionary. * Fades the sound to the specified volume over the specified amount of time. * Mutes the volume for all sounds in the sound dictionary. * Resets the volume to their original setting for all sounds in the sound dictionary. * Sets the volume of the specified sound. * Gets the volume of the specified sound. * Gets the position of the specified sound. * Gets the duration of the specified sound. * Gets the sound object of the specified sound. * Identifies if the sound is paused or not. * Identifies if the sound was paused or stopped by calling the stopAllSounds() or pauseAllSounds() methods. A new 3d physics library is under development and in early stages called jiglibflash. 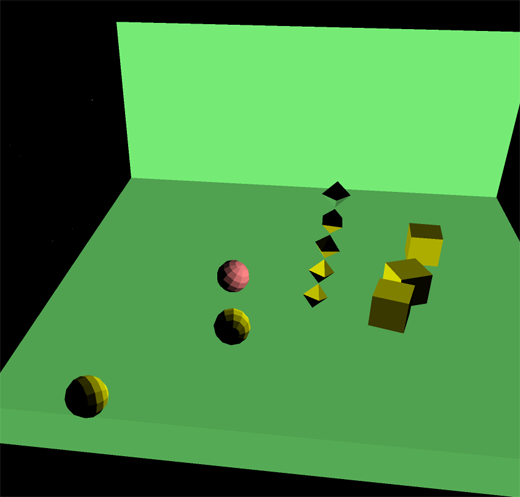 Like the Box2D ports it is based on a C++ library of the same name called jiglib, only this is 3D instead of 2D. It is similar in purpose to WOW Engine which is the other current open source 3d flash physics engine. For more on this toolkit see the links below. UPDATE: katopz has also ported this to use Away3D as the renderer. UPDATE: Also updated for the sandy3d engine as the renderer.